These charming Pinellas County homes are in a great location and come at an affordable price. Built in Palm Harbor, Florida in the late 1980's, externally they feature caged swimming pools, sprinkler systems on reclaimed water, and attractive landscaping. Inside cozy brick fireplaces, tile flooring, newer appliances and vaulted ceilings can be found. Ranging in size from 1600 sq. ft. to 2000, they are an ideal size for singles, small families or as a second home. Palm Harbor is a great place to raise a family. Exceptional schools, beautiful city parks, gulf beaches and recreation facilities are abundant. Walk to shopping, grocery stores, banking, and restaurants, plus a short drive to larger shopping centers with popular fashion clothing stores. Large church right next door outside the development with Sunday services and school. You can't go wrong with this superior location and neighborhood. You will love it. Search the Palm Harbor MLS for homes now! Selling your home in Alderman Ridge? 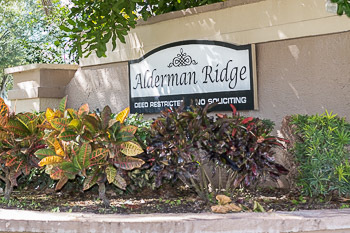 Have you thought about selling your home in Alderman Ridge of Palm Harbor? We would like to speak with you and interview for the job. We are confident that you will be pleased with our services. Our team will apply the best marketing strategies to ensure the most possible sale of your home. Call us at your convenience and start by getting a quote.